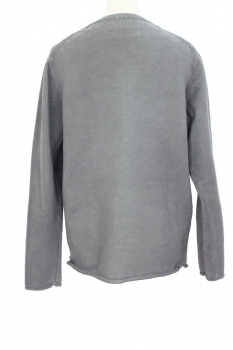 Rundholz Dip Collection Mens knitted pullover, over dyed in heavy stretch knit in coal colour (light grey), distressed, very heavy. Seam details at arms and under neck detail. 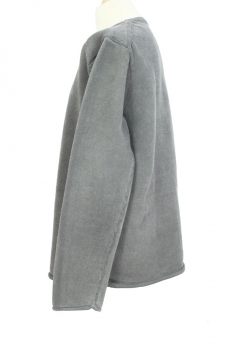 The neck is round with knitted ribbed trim. Knitted, ribbed trim. Arm cuffs are rolled. The hem is rolled with short vents at each side. This is a superb piece of clothing, very substantial and unusual as the knit is made from a stretch fabric.